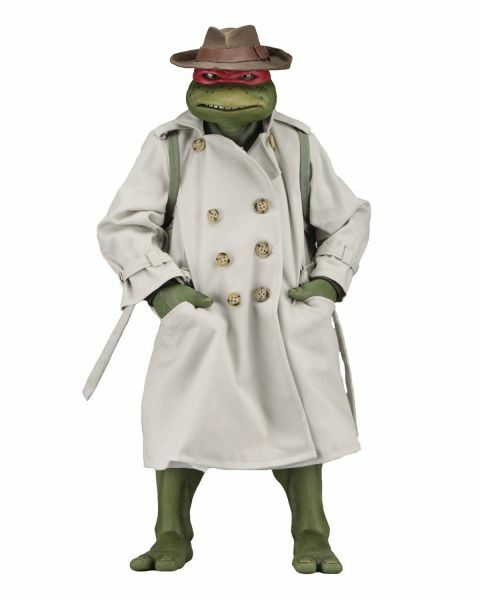 Produktinformationen "TEENAGE MUTANT NINJA TURTLES MOVIE RAPHAEL IN DISGUISE 1/4 SCALE ACTIONFIGUR"
NECA's newest 1/4-scale action figure from the 1990 Teenage Mutant Ninja Turtles movie is Raphael in the disguise he uses to pass through the city unnoticed! He wears a fabric trench coat and sculpted hat and backpack, all of which are removable. Raphael stands 16 1/2" tall and features 30 points of articulation, including double elbow joints, to fully showcase his mastery of the martial arts. The figure is highly detailed and entirely accurate to the movie, and comes with baseball bat, pizza slice and sai accessories, as well as interchangeable hands. Weiterführende Links zu "TEENAGE MUTANT NINJA TURTLES MOVIE RAPHAEL IN DISGUISE 1/4 SCALE ACTIONFIGUR"
Kundenbewertungen für "TEENAGE MUTANT NINJA TURTLES MOVIE RAPHAEL IN DISGUISE 1/4 SCALE ACTIONFIGUR"